Wedding albums coming and going thick and fast at the moment and one of the latest to head out the door was from Heather & Chris’ wedding day at Altskeith House last December, which was to be my first visit there and what a stunning location it was on the banks of Loch Ard :-). Such is the range of materials and colours available these days, Heather & Chris dropped by the home office/studio one evening in July to look though all the options and make their choices, making full use of the lab’s new material swatch box. 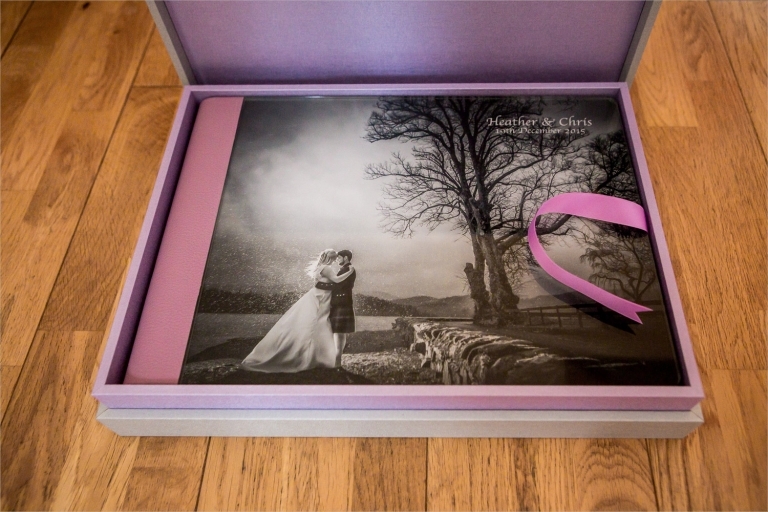 For their album, the guys chose one of Graphistudio’s “Original Wedding Books” and opted for the popular “crystal glance” cover complete with a lilac leather binding. This was all topped off by a complementing design box in silver and lilac linen. You can probably tell that I’m a big big fan of wedding albums and I absolutely love to see your wedding pictures displayed in this way :-). Of course, I’m biased, but I do believe that I’m partnered with the best album company in the world, Graphistudio from Italy, used by the majority of top professional wedding photographers worldwide. Check these out…there’s so many ways in which the album can be customised in terms of covers, back & spines, boxes, colours etc, that apparently there are about 4 million different combinations in total! PS – click on any of the images below to view large!